GA. Sheriff's Association says the same! There are not enuff FA's to take guns in this state. Hillary likes the Australian confiscation model of gun control. . & crazy enuff to try. That's why they are trying to take them one at a time, with "common sense gun control". The shift of power in the supreme court.. could easily influence what happens soon. has anyone shaken Ginsberg lately to see if shes still breathing? How would the supreme court decide anything with a law? Only the Congress can do that and it's mainly republican at the moment. Supreme court, The judiciary branch is the third branch of government. It is powerful.! After all, the Supreme Court interprets the Constitution and that impacts each of us. Ha ha ha... ! Post it...! That's great! Short & powerful.. makes a great statement brother! You in Ga. Invite? I'm just north of Atlanta, or somewhere near? Damn... what are the odds? Please God.. let EMDE also be a Packers fan! I posted this minutes before I saw your location.. or would have made the city "Atlanta"! I have to make a run.. will be off for a bit. Lets find a meme location for an eml swap.. get to have beer sometime. I would agree with you! There are lots of exceptions.. good point! Upvoted your meme. Ha ha... thanks! I upvote lot of stuff I may not agree with.. but when creativity and thought goes into it.. or a perspective I can identify with.. i give upvotes. I don't always comment on your stuff. . But give a lot of upvotes! Keep going .. you have some outstanding memes! This was the comment I was referencing. I took it as you appreciated I respected another perspective. . Which I truly did. It's always nice to be complimented in any way from other users.. even if views differ. 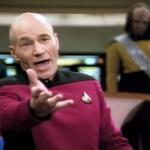 You're a stand up guy for making that comment.. &I think (IMHO), set a great example to newer members. Might help change that downvote culture. Thanks brother! Those stereotypes, try to not stick yourself, or others in one. LMAO! PERFECT! Deserved more upvotes! Post it bro! Also note: my spiritual beliefs don't fit perfectly to any particular religion, but I was baptized to the Orthodox Church. Technically making me a Christian in that sense. Whatever your beliefs,.. you're still polite and a gentleman, which is a reflection of your character that people will identify with in a positive way! Opinions differ.. but our character defines us a lot more. Keep up the great work! I enjoy your stuff! Damn.. sorry I missed this on an upvote brother! I made it up to you on other memes! Was already done bro.. ! Damn msgs take so long to send. .
LMAO.. ! If I was sipping bourban.. i would have sprayed my phone! Allow me to upvote.. ! More coming bro.... ;) ! I dunno about all Catholics.. there's a split going on in the church with liberal & conservative catholics. I'm with you ! Thanks for commenting! Upvote! 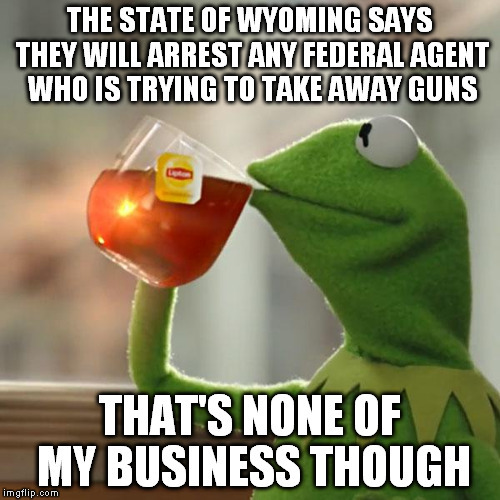 Hmmm.. these states don't violate federal law though. there are over 200 sanctuary cities in the US that ignore federal law when it comes to prosecuting illegal immigrants. May be more.. since some state counties practice this as well. Thanks for the meme.. ! Any blue helmet brought in by this bozo in the whitehouse is not our friend. . ! There's a shadow of a troll somewhere. . Downvoting again. You were at 0 pts.. i upvote, &ur down 1. Dude.. you -1 before I got here to respond.. you have a tail. Baptist are baptist.. Anglicans are Anglicans.. and islam is... "different"
Why the hell hasn't a Christian read their Bible where it says to be holy in all manner of conversation. Damnit to hell! 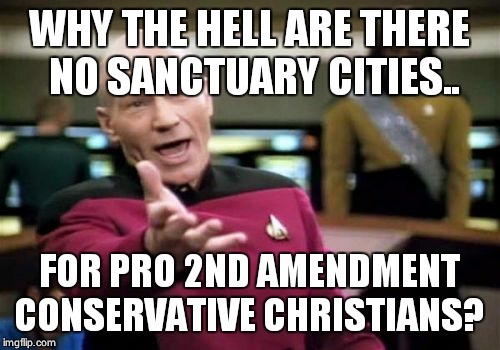 WHY THE HELL ARE THERE NO SANCTUARY CITIES.. FOR PRO 2ND AMENDMENT CONSERVATIVE CHRISTIANS?